The Connacht champions have switched up their leader for the defence of their crown. ROSCOMMON’S LEADING SCORER from open play in the successful 2017 Connacht Senior Football Championship, Conor Devaney, will captain his county in 2018. Devaney scored 2- 4 from half-back, including three points against Galway in the final, to help Roscommon lift the JJ Nestor Cup. Devaney was an All-Star nominee this year and has made 85 appearances for his county. Manager Kevin McStay selected the Kilbride man to replace Ciarain Murtagh who served two years as skipper. Murtagh and David Murray will act as vice-captains for the year ahead. Email “Kilbride's Conor Devaney named Roscommon captain for the year ahead”. 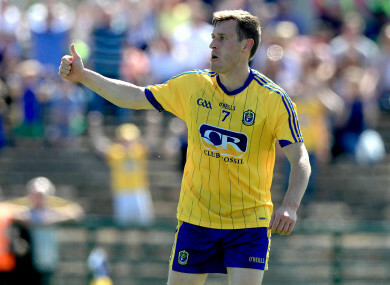 Feedback on “Kilbride's Conor Devaney named Roscommon captain for the year ahead”.